The Army is currently testing the Army Combat Readiness Test as a replacement for the APFT. If adopted, the ACRT could be implemented Army-wide beginning in 2018. Assesses the fitness demands of the job, sport or event. Leg Tuck – Similar to the knees to elbows exercise and no time limit is prescribed. The ACRT is designed to test what the Army has identified as 5 “domains” of combat fitness: Muscular Strength, Muscular Endurance, Cardiorespiratory Endurance, Explosive Power and Speed/Agility. Below are the problems I find with the test. I understand it’s easy to criticize, so at the end of my criticisms, I offer my own replacement for the APFT. The test requires two kettlebells, a sled, plates to load the sled, a medicine ball, a trap bar plus plates for the dead lift, and a pull up bar. In my work with line unit Army soldiers, gym equipment for training is a major issue. While any military base will have several weight rooms on post, because every soldier on the base does PT at the same time – 6-7am in the morning, weight rooms are crowded and there is never enough equipment. Every 30-man platoon will need 5-7 completes sets of plates, kettlebells, trap bars and sleds adequately train for the assessment. This will be difficult to fund and more difficult to store and account for. Eventually what will happen is many soldiers won’t be able to adequately train up for the assessment – which is unfair, as fitness test scores are such a huge component of Army performance evaluations. Without the equipment needed to train and learn the movement, without close coaching for 3RM attempts, and with the incentive to push numbers because of scoring, these efforts will get sloppy and lead to injury. The assessment designers sought to minimize this by using a trap bar and 3 Repetition Max instead of a regular barbell and a 1 Repetition Maximum, but these modifications won’t be enough. Further, it will take a fairly long time for determining 3RMs for a battalion full of soldiers. The warm-up will have to be the same, and I’m assuming it would be administered high-jump or pole-vault style, where weight keeps getting added to the bar and athletes have to make each attempt to keep advancing. For stronger guys, this could take some time depending on the jumps in loading. To be fair, incremental jumps of 5 pounds would be best … but this would take forever…. The Power Throw is in the assessment to test explosive power – but in our work, medicine ball throws are as much technique as fitness. The problem here is with the identified combat “fitness domain” of explosive power. I’ve always found this to be a nebulous concept to clearly identify and give an example of in the battleground. It’s easier to see how explosive power – especially hip explosion – is needed for a football lineman coming out of his 3-point stance and “exploding” off the line into his opponent. It’s also easy to see how the power clean and other Olympic lifts train this hip explosion and explosive power and how this work transfers to the football field. The problem with this event in a tactical assessment is I can’t easily find the battlefield example of explosive power. For this test, in particular, the way to train explosive power best is Olympic lifts – which line unit soldiers will have difficulty getting the equipment for. Other ways to train it could be loaded and unloaded box jumps, broad jumps, etc., but would the improvement on these events transfer to a longer backward medicine ball throw? I’m not sure. And even so, line unit soldiers won’t have the equipment to train. At MTI we love the 300m Shuttle as a measure of speed, anaerobic power, and agility for tactical athletes. The problem with this event is the addition of the sled pull and kettlebell farmer’s carry at the end. Both are equipment intensive – which is its own issue. This event will be scored by finish time, and the problem with the sled pull is the type of sled and sliding surface dictate friction and pulling effort more than the weight on the sled. As an example, let’s say the test is being completed on a grass field at Fort Carson, Colorado in Mid-March. If it froze or nearly froze the night before, the icy grass would make for a slick sliding surface first thing in the morning – or easier sled pulling. Later in the morning, when the sun came out and melted the ice on the grass, it would be wet – making for a sticky, harder pulling surface for the same type and weight of the sled. Even later, when the grass had dried out, the dry grass would create a different sliding surface in terms of friction. The point is, there would be no way to “control” this surface for every individual soldier, would create an unfair assessment. Overall, this event is unnecessarily complicated. While I like the idea of this exercise over the current sit-up in the APFT for an assessment of core strength, I’d prefer the Pull Up Bar Heel Tap simply because range of motion for the event would be the same for everyone – full elbow/leg extension at the bottom, and heels tapping together above the pull up bar at the top. Only during PT tests and early AM PT training do Army soldiers run unloaded. Downrange, during field-based training evolutions and during schools and courses they are loaded with a ruck and a rifle, at a minimum. So why not a ruck for time as an assessment of cardiorespiratory endurance? To be fair, the test events will have to be administered in the same order for all soldiers and the rest time between events will be the same. 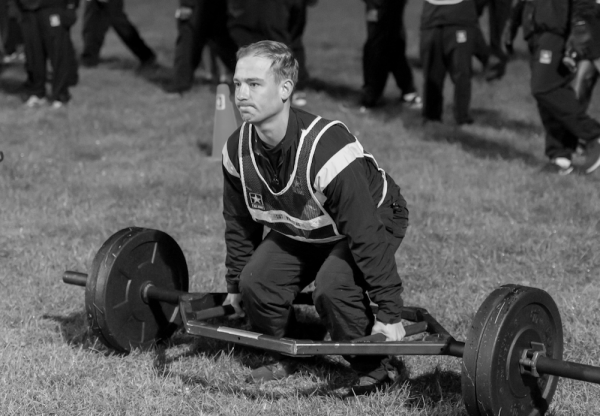 The traffic jam will occur during the 3RM Trap Bar Deadlift, as the stronger soldiers will take some time to fully assess, and the other soldiers will stand around waiting before moving to the next event. I’m assuming if the test is implemented, prescribed time limits will be dictated for the Leg Tuck and T-Push Up events, which will speed things up – but not enough to account for the 3RM Dead Lift. What I do like about the test is the T-Push Up. We’ve moved to similar Hand-Release push ups for our own bodyweight assessments and find these to be much more difficult to complete than regular push ups, and much more easy to see a proper range of movement. Limited Equipment – All that is needed is a pull up bar, issued body armor, 40-pound ruck and weapon. Fitness Attributes Assessed – Upper body strength and strength endurance (Pull Ups and Hand Release Push Ups, Core Strength (Pull Up Bar Heel Tap), Anaerobic power, speed and agility (MTI Tactical Athlete Work Capacity Assessment), Mission-Direct strength and cardiorespiratory endurance (3-mile Ruck for Time). Easy to Administer and Score – Time limits for the Hand Release Push Ups and Pull Up Bar Heel Taps will move things along. The MTI Tactical Athlete Work Capacity Assessment takes 11 minutes to administer. The 3-mile Ruck at the end will be the longest event – up to 45 minutes for the slowest athletes. Strict Pull Ups – no kipping – full elbow lock out to bottom of chin touching pull up bar. No time limit. Athlete can “rest” in the down position – hanging from the pull up bar. No swinging backward in the bottom position. Each rep begins with the athlete hanging still from the pull up bar with his elbows at full lock out and legs hanging straight. Athlete can rest in the down position hanging from the pull up bar. 3-Mile Ruck Run for Time at 45#. Many schools and selections (Ranger, Airborne, SFAS, Expert Infantryman Badge, etc.) use a 10 or 12 mile ruck as part of their initial “gate” assessment or another scored event. For this reason I’ve always wondered why a ruck event was not part of the APFT. The 3-Mile event here will address this.